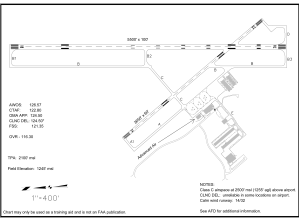 Runway 18/36 is 5,500 feet in length and 100 feet wide. Runway 18/36 was built for CII category aircraft with landing speeds less than 141 knots and wing spans of less than79 feet. The north/south alignment will provide 93 percent crosswind coverage with winds less than 10.5 knots. Landing weight is designed for single axle weight of 60,000 lbs. Approaches are VOR-A (GPS), RNAV (GPS), LPV and ILS. ILS Approach to Runway 36 is 200 and ¾ mile visibility. Check approach charts for accuracy. Lighting is high intensity edge lights with runway end identifiers and strobes. Runway 18 has a two light PAPI (precision approach path indicators). Runway lighting at night is pilot controlled lighting on frequency 122.800. Three clicks for low, five clicks for medium and seven clicks for high. The lights are on a 15 minute timer. 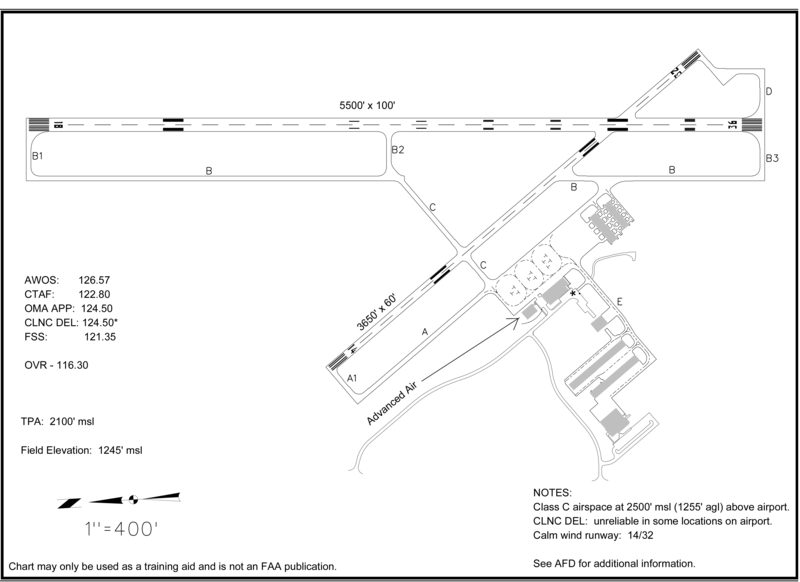 Runway 14/32 is 3,650 feet in length and 60 feet wide. Runway 14/32 was built to B1 category aircraft. Landing speed 91 knots to 121 knots, wing span up to 49 feet. Runway 14 is identified as the “calm wind” runway. Approaches will be VOR-A (GPS), RNAV (GPS) and LPV. Runway lighting at night is pilot controlled lighting on frequency 122.800.